Whenever I attend the National Space Symposium in Colorado Springs, I leave the conference with what feels like a brain 2x larger than when I arrived. There is so much information imparted to attendees that ones brain cells are flooded with new data, new contacts, new technologies  in this case, having a headache is a good thing, as such means a ton of information has been absorbed for current and future synapse processing. INSIGHT: The Forrester Focus, Over-Expansion In Middle East Satellite? The Middle Easts two indigenous satellite operators are both building new satellites for their region. ArabSat is on a set of more aggressive expansion plans, which in essence sees Arabsat launching a new craft every year until 2012. Nilesat is also busy, and its 201 craft will launch early in 2010. If new capacity were limited to just these pair, then there would not be a problem, argues Nabil Kazan, a well-known name in Arab broadcasting. The financial results are in for the year 2008 and they are very positive! The global FSS (Fixed Satellite Services) operators all reported annual revenue growth in the 8 percent-12 percent range and EBITDA margins from 78 percent to 82 percent. Certainly, this is good news for the operators and it should trickle down to some extent to the larger integrators such as Caprock, Artel, Globecomm, and others. Smaller integrators however, are struggling under the pressure of tight credit, high capacity utilization, and costs associated with creating support infrastructure. New satellites have been launched successfully and there are more under construction. Overall, 2008 was a good year in the industry. The broadband satellite market over the last two years has been very successful with consistent gains in sites, subscribers and revenues. The strong growth recorded in 2007 flowed through into 2008, and as of the writing of this study, the market appeared to still be holding up in most parts of the world. While many in the industry are confident that the broadband satellite sector will weather the current difficult economic climate only lightly scathed, there is no doubt a strong undercurrent of uncertainty. The sales process has been slowing for broadband VSAT networking services, satellite capacity issues and high capacity prices are impacting certain markets, fiber and undersea cable continues to be rolled out impacting trunking services, and no one today is sure to what extent various government programs to bring broadband to rural areas in developed countries will truly help single site satellite broadband service providers. The U.S. satellite industry has a great deal to worry about these days ­ lost opportunities due to outdated export control rules, global competition from more and more countries every day, the various technical challenges of providing new services  but theres another issue out there affecting the entire aerospace industry that demands attention in the satellite sector  a looming workforce crisis. Hurricanes and tropical cyclones develop in various places around the world all year round, and NASAs Hurricane/Tropical Cyclone Webpage covers them. The webpage offers daily storm updates and satellite images, latest research, stunning video animations, educational tools, scientists profiles and historic storm information, on all storms going back to 2005, including monsters like Katrina. An improved understanding of the Earth System � it�s weather, climate, oceans, land, geology, natural resources, ecosystems, and natural and human-induced hazards � is essential if we are to better predict, adapt, and mitigate the expected global changes and their impacts on human civilization. Earth observation data and derived information are essential inputs in the development of this understanding. 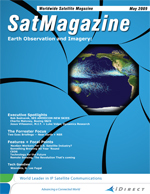 Earth observations provide the evidence necessary for informed decision-making � supporting the science which underpins strategies for global environmental decision-making � and for monitoring our progress on all geographical scales as we explore new development paths aimed at sustainable management of the planet. When one wishes to learn about a specific program, the best way to proceed is to contact the subject-matter experts who are responsible for much of the work surrounding the project. This certainly holds true for NASAs HETE mission. Rob Bednarek heads up global satellite services company SES AMERICOM-NEW SKIES, a newly combined division of SES that brings together SES AMERICOM, the leading supplier of satellite solutions in the U.S., with the strategic global satellite services of SES NEW SKIES. Charlie Maloney is the GOES N-P Program Manager for Boeing Space and Intelligence Systems within Boeing Integrated Defense Systems. In this role, Maloney is responsible for final systems testing and launch preparations of the nexgen series of Geostationary Operational Environmental Satellites built for NASA and NOAA. The broadband and Internet revolution has finally reached the maritime sector. The Internet generation is no longer a land-based only system. Users at sea expect similar network performance as they receive at home. Access to communications you have come to depend upon is just as much a necessity at sea, whether it is for contacting headquarters, family and friends, or for entertainment purposes. Suddenly, crew welfare is at the top of the agenda for many ship owners and most crews are likely to apply for work on vessels offering the best broadband service. Enormous bandwidth is needed to satisfy passenger and crew voice and Internet links as well as a wide range of value-added services. Almost everyone has seen the television news casts and Internet reports featuring meteorological images that illustrate the weather forecast. These reports have an immediate impact on our daily lives and it is something that we have all grown accustomed to. Wavelets are used extensively in Signal and Image Processing, Medicine, Finance, Radar, Sonar, Geology and many other varied fields. They are usually presented in mathematical formulae, but can actually be understood in terms of simple comparisons with your data.